ACRE is telling me it couldn't update the plugin? ACRE is telling me my plugin version mismatches but my preset it up to date! What gives? handshake_failure? I don't remember anyone trying to shake my hand! Unfortunately if it's 10 minutes before the start of a mission, we may not be able to help in troubleshooting so please try to test well in advance of a planned Saturday mission. You don't have all the addons checked in under Addon Groups in the Addons tab. To fix this easily, uncheck the entire Clear Backblast group and recheck it. Assuming the above has been done, your load order may out of sync for your mods. To fix this go to the Addon Priorities pane in the Addon Options tab. Click the red X on the right side to reset addon priorities. This can either be a game or a mod related issue. Please take notes of what exactly if kicked you for. If it doesn't specify what you're being kicked for, ensure your plugins are up to date in Arma 3 Sync. If they are, check to see if you're subscribed to that same mod in the Steam Workshop, which has the possibility for compatibility issues regarding different versions and signatures. When launching Arma ACRE will check what version the client, check what plugin version is in their TS directory and move the plugin as needed. When Teamspeak is loaded however its enabled plugins are locked as they are. When ACRE tries to update it, it will fail and show an error message with the option to continue. If this happens you should close both Teamspeak and Arma, launching Arma by itself to move the plugin. It'll give you a message saying it was successfully moved. Hit 'ok', then launch Teamspeak like you normally would. 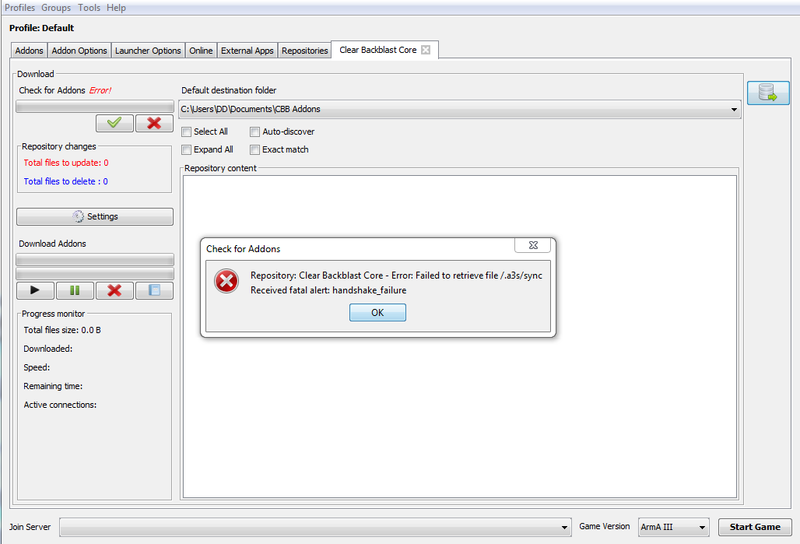 Start Arma 3 Sync, navigate to the CBB repo in the Repositories tab like you would be updating the preset. Wait for it to finish checking. Select all files and click the 'play' button to update like you normally would. Start Arma while Teamspeak it closed, wait for it to say it moved the plugin. Launch Teamspeak and verify your ACRE plugin version has changed. Make sure both ACRE and Arma (or Arma 3 Sync) are set to run as admin. The biggest sign that one or the other isn't being run as admin is if people can hear you talking over radio but they're unable to hear you talking locally. Try restarting the ACRE plugin. In teamspeak, go to Tools → Options (Alt+P) → Addons and click Reload All at the bottom of the window. Try restarting ArmA and teamspeak. This is sometimes dependent on how your Teamspeak or Windows sound options are set up. For Teamspeak, check the playback options in Teamspeak and make sure it's set to stereo and 3d positions for clients. 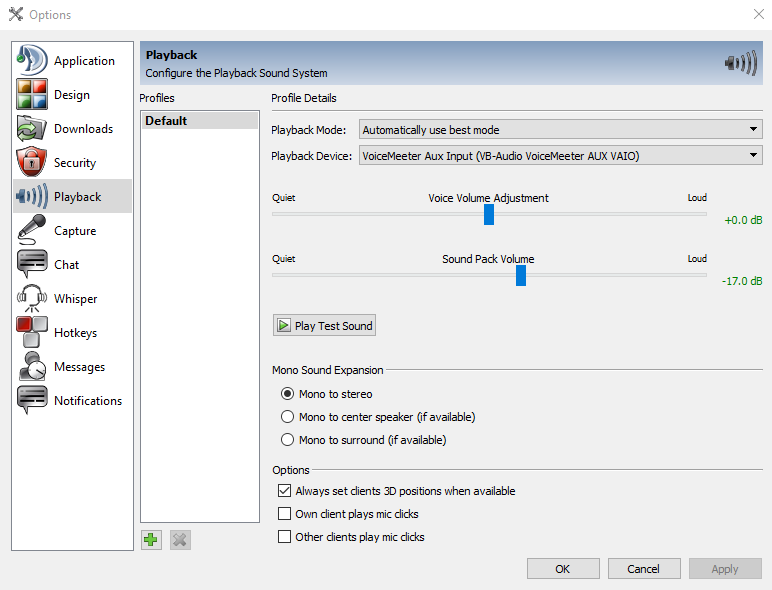 For Windows, make sure your device is set to stereo audio. This can be changed by clicking the Configure button on the device in the Windows playback devices menu. This is typically the result of having an out of date version of Java, Arma 3 Sync requires Java 8 and above. You can download the latest version of it here. Multiple installs of Java could still cause it to fail so it's advised to uninstall any previous versions first.